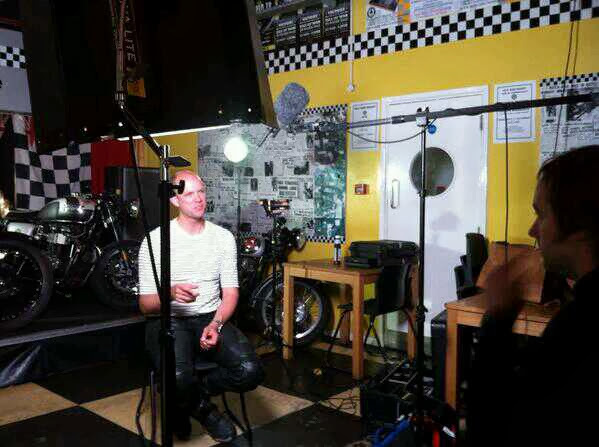 A little while ago I was asked to contribute to a BBC4 Timeshift documentary about motorcycles. It was a really enjoyable experience; my wife does lots of media work and is forever appearing in the press or on radio and TV but this was entirely new for me. The photo above is me at London’s Ace Cafe – I don’t know if I made it through the edit yet but it promises to be a great piece. Also interviewed was Mark Wilsmore the person responsible for the reopening of the cafe. Lovely chap and purveyor of London’s best bacon buttie and a lovely cup of tea. Len Paterson is also featured; Len has always been very helpful and supportive of my research and is a familiar face at bike events in and around London and has organised some himself, particularly the tribute to Father Graham Hullett of the 59 Club..
Timeshift returns with an exploration of the British love of fast, daring and sometimes reckless motorbike riding during a period when home-grown machines were the envy of the world. From TE Lawrence in the 1920s, to the ‘ton up boys’ and rockers of the 1950s, motorbikes represented unparalleled style and excitement, as British riders indulged their passion for brands like Brough Superior, Norton and Triumph. But it wasn’t all thrills and spills – the motorbike played a key role during World War II and it was army surplus bikes that introduced many to the joy and freedom of motorcycling in the 50s, a period now regarded as a golden age. With its obsession with speed and the rocker lifestyle, it attracted more than its fair share of social disapproval and conflict. Narrated by John Hannah. John Hannah no less! Stop all the clocks…. Anyone who can knock out WH Auden that well and get stuck into a motorcycle documentary is alright by me. I wonder if he rides? I really enjoyed the programme. There should be more attention given to the contribution two wheels have made to cultural and social history. Beyond the mods and rockers in the UK what would be fascinating is to look at how motorcycling was organised in Nazi Germany. The culmination was the Nazi TT of 1939 but it would be interesting to develop an understanding of the development in Germany and even italy. The documentary crew interviewed me for about an hour, maybe ninety minutes in total, and only used a few minutes. I know that they said they had enough footage to make the film three hours long, which is a lovely thought. Alas they had to make a one hour film and I think they did a great job.